Dedicated to find the truth about climate change. Climate Change Truth Inc. We are an organization dedicated to find the truth about climate change. Our areas of study are below. We are looking for federal, state and private grants for a 10 year study. I called the company climate change truth because I am a scientist and we should always follow the data instead of fitting the data to what we want to fit it to. Increasing Photosynthesis is mitigating atmospheric carbon dioxide rise. I contacted the USA Embassy’s in South America, India and China. Talked to their environmental scientists and they saw the correct science and what we need to do. India stopped deforestation of their rain-forest. China is increasing their forests by 1% each year for two years. Pakistan is planting 10 billion trees within 5 years. 20 billion tons less emissions per year will equal current photosynthesis. This means no human emissions. The current photosynthesis amount consumes 9.6 billion tons annually. CO2 concentrations will begin to decrease only when net emissions go to zero, very roughly speaking. We need to fix the photosynthesis issues. So we can keep current lifestyle. Plant 1 billion native shrubs and 1 billion native trees all over the world. All Government policy document to bring atmospheric carbon dioxide down quickly. New plantings will be listed here. On the funding page you will see GoFundme and paypal donate links. Corporate of Government support contact us through the contact page. Water vapor evaporation rates from oceans for Weather modeling. This changes based on salinity and temperature. Increased evaporation is mitigating most ocean rise due to Glacier melt. Diffusion of Carbon Dioxide at various altitudes in the atmosphere. This will produce a diffusion gradient. Please watch this important Global Warming video. 3 mm per year ocean rise. Minimum 2.2 mm max 3.3 mm/year. 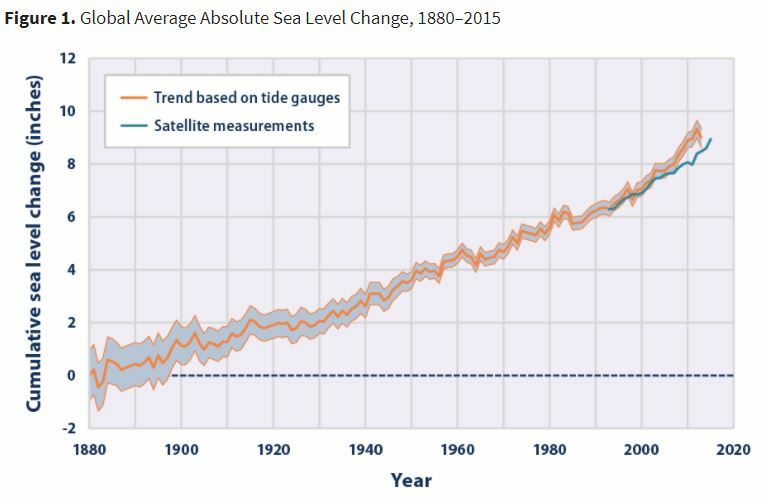 It is said the sea level is rising. This is technically true. (See the blue line satellite data continues on the same slope as previous data.) About 10 inches since 1870. As the oceans rise the surface area expands and the evaporation rate increases due to warming oceans and dilution of glacier water. The increasing evaporation is mitigating all the ocean rise due to glacier melt. This increase is also responsible for increased weather and storm clouds. Previously the clouds blocked 20% of the sun’s energy from warming the earth. Now that is increasing with more clouds and soon the temperature increase will stabilize. Just as one data point does not tell the global data. We are now working with Sea Surface Height science team in the NOAA Laboratory for Satellite measurement. We have the RADS software (Altimetry data are provided by the NOAA Laboratory for Satellite Altimetry) installed on or server made Graphs by each 10 degrees latitude. The graphs we made show approximately the same rate of rise at each latitude. ocean rise This means increased evaporation is mitigating all ocean rise due to Glacier melt.This is the same we did for Atmospheric CO2 and Temperature. You can see these graphs on the data page.